DEFIANCE, OH–The Mustangs have experienced the usual highs and lows that any first year program will encounter. On Wednesday, the Mustangs were able to stand tall after a 3-2 road victory over NCAA Division 3 opponent, Defiance College. The Mustangs, no stranger to the underdog role, traveled to play the Yellow Jackets of Defiance on Wednesday. The NCAA D3 Yellow Jackets (3-6) would be another tough task for the first year Stangs, but this time the men from Marygrove were up to the challenge. Nearly 33 minutes of scoreless action highlighted a defensive-minded first half before the host Yellow Jackets got on the board first. Defiance’s Zachary Nawrot slipped one past goaltender Garrett Gregg to put the Mustangs in a 1-nill hole. The Mustangs were quick to answer as freshman forward Joseph de Verteuil got the Mustangs’ party started with a goal to tie the game at one-one. The goal found the net fifty-three seconds after the Yellow Jackets climbed on top. The first half would end tied, 1-1. The second half was owned by Mustang forward Jordan Berry. A two-goal second half performance lifted the Mustangs to a 3-2 victory. The win was the second of the season for the Mustangs and the second time Berry notched two goals in one contest. 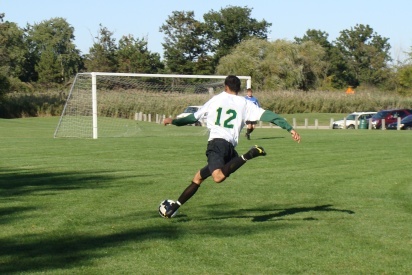 Freshmen Hussein Seklawi and German Jiminez added an assist on each of Berry’s second half goals. More importantly, the Mustangs continued to fight as they have done all season. Berry needed both goals to lead the Mustangs to victory after the Yellow Jackets tied the game (2-2) at the 78-minute mark. Berry’s last goal would put the sting back in the Yellow Jackets when the ball left his foot for the back of the net with only 2:30 to play. The gritty 90-minute effort enabled the Mustangs to lift their record to 2-7 on the season. Garrett Gregg (Livonia Clarenceville High) earned the first win of his career as netminder for the Mustangs. The busy eight-save performance, coupled with a stellar showing by the Mustang defense (Munt Al-hussain, Dave Jock, and Mike Rothenberg), kept the Yellow Jacket attack at bay and made the 3-2 win possible.